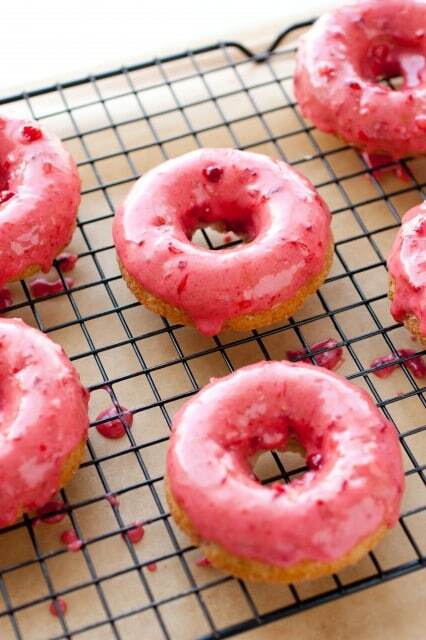 Strawberry Donuts! Oven baked and brimming with bright, sweet strawberry flavor – thanks to the use of both fresh strawberries and freeze dried strawberries! They’re soft and tender and finished with the most tempting glaze. Who could resist? 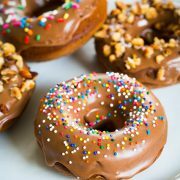 When you think of a glazed doughnut, do you think of a sticky, wet, glossy coating or a matte, somewhat shell like and dry coating? My thoughts lean toward the matte coating. 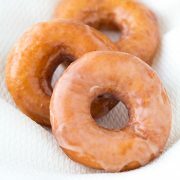 Maybe that’s just me, but I don’t think doughnut glaze should be really sticky because that, in turn will usually result in a soggy doughnut. I don’t know what the deal is lately but the third recipe test is a charm with me. I created a second recipe, doughnut was good, glaze bad. Not taste wise bad, consistency bad. What happens when you mix strawberries with sugar? Basically the strawberries begin to break down and some of the liquids are extracted (some sort of osmosis) and the mixture becomes juicy. So why did all of the strawberry glaze recipes I saw online call for water? I added it in mine the first time around and the glaze didn’t set and dry, so the simplest solution? Omit the water and rely on the juices from the berries to thin the glaze. It worked like a charm. And if you are wondering why their are two different tones of glaze, the first one doesn’t have any of the strawberry powder in it and the second, more vibrantly reddish pink does have the freeze dried strawberry powder. If I’m going to give a certain something a main flavor I want to taste that main flavor. I just wasn’t getting enough strawberry flavor with fresh strawberries alone so I went with a more concentrated flavor without all the liquids by adding in some freeze dried strawberries as well. Yes, you can leave it out if you really don’t wan’t to purchase them, but you won’t get that vibrant strawberry flavor – you’ll get more of a light and mellow strawberry flavor. 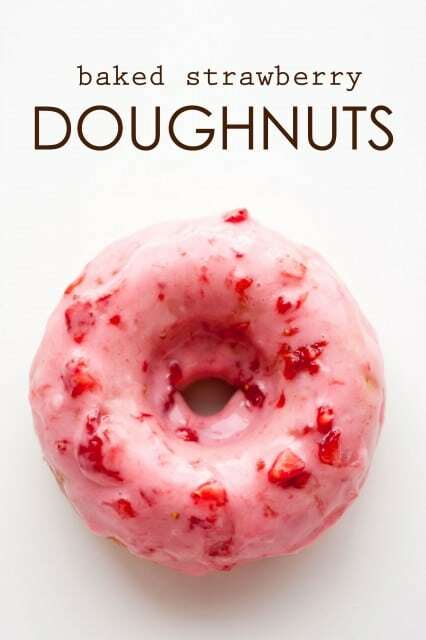 I must say though these doughnuts are a.maz.ing! My family and I had them devoured in no time. Enjoy! 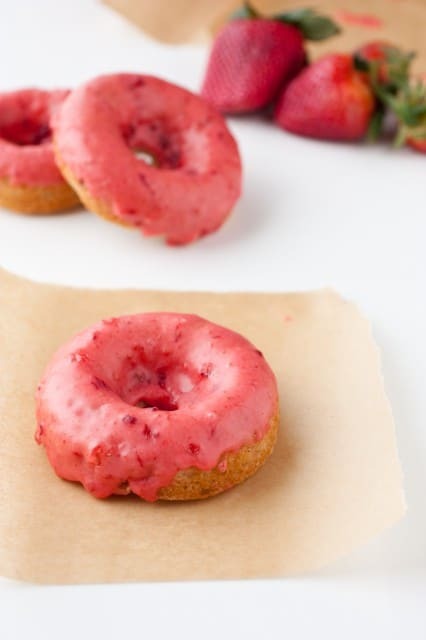 Oven baked donuts that are brimming with bright, sweet strawberry flavor - thanks to the use of both fresh strawberries and freeze dried strawberries! They're soft and tender and finished with the most tempting glaze. Preheat oven to 375 degrees. Butter doughnut pans with room temperature butter, then sprinkle lightly with flour and shake upside down to remove excess flour. In a large mixing bowl, whisk together flour, sugar, baking soda and salt, make a well in center of mixture and set aside. In a separate mixing bowl, whisk together buttermilk, vegetable oil, vanilla and eggs (mixture will appear to curdle a bit which is fine), then pour into well in flour. Using a wooden spoon, stir mixture just until combined, then fold in 2/3 cup finely chopped strawberries. Spoon 2 1/2 Tbsp batter evenly into each well of the doughnut pans. Bake in preheated oven 11 - 13 minutes until toothpick inserted into center of doughnut comes out clean. Allow to cool several minutes in doughnut pan then invert onto a wire cooling rack to cool completely. Once cool dip top halves of doughnuts into glaze and allow some of excess to run off, then return to wire rack, glazed side facing upward. Transfer doughnuts to freezer to allow glaze to set, about 5 minutes. Prepare glaze just before dipping cooled doughnuts. In a mixing bowl, combine 1/2 cup finely chopped strawberries and half of the powdered sugar. Stir until mixture starts to become moistened, then allow to rest 1 minute. Add in remaining powdered sugar and freeze dried strawberry powder and stir until well combine***. Use glaze immediately. 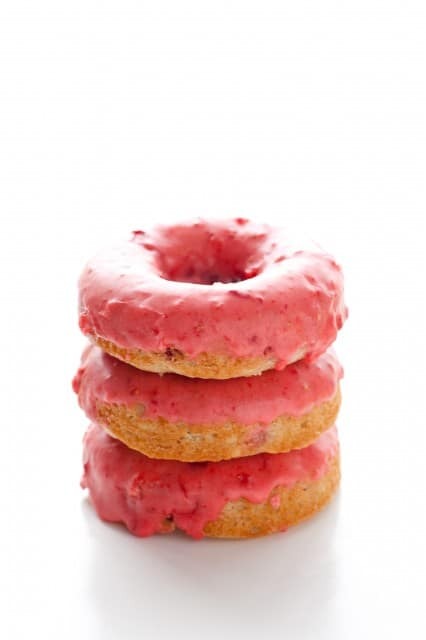 *For the 1/2 cup finely chopped strawberries for the glaze, don't chop until just before adding to glaze mixture (so they don't break down and become too watery) and don't prepare glaze mixture until doughnuts have cooled completely and are ready to be glazed. **I would say this is optional, if you omit it you just wont get as much strawberry flavor. Still a delicious doughnut just a lighter flavor. Also if used, the color will be more vibrantly reddish pink than the first picture posted. ***At this point mixture should be have the consistency of a thick glaze, and have a dip-able consistency, if not allow to rest another minute or two until some of the liquids have been extracted from the strawberries then stir again. I would not recommend adding water to thin. Just allow it to rest if needed until the strawberries begin to break down. I want to try these doughnuts for my daughters party. I’m just wondering how well the glaze would stay on the doughnuts, especially if the weather is warm..? Would it just become soggy and sticky, or does it sit nicely..? And how long for? These look fab! I want to make them for an outdoor bake sale. I’m in Scotland so the weather is not too hot. Max temp will b around 20c. 2. Can I bake and glaze them the day before? 3. How long do they keep fresh for? Sarah: Thank you so much for your reply :) I defiant to make these and have been bookmarked for sooooo long. I have finally got a mini doughnut pan so thought would be great to masks on the weekend. Just worried how they’ll hold off. Prob better just making it for when I have something on at the house. 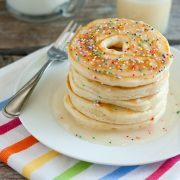 I want to make these for my boyfriend’s birthday as they look FAB! He jokily asked me if I could make him a giant doughnut cake and I thought I might actually give it a go. Do you think your recipe would work for 1 large doughnut/cake? I’d obviously have to adjust the timing and perhaps temperature. I finished it with white chocolate shavings and powdered freeze dried strawberries. Wanted to post a photo here but can’t see how to. It looked and tasted just like the real thing… but better! So… thank you SO much! I fear I have set the precedent for all future birthday cakes now!